Israel and Palestine have reached an agreement 'in principle' over a set of proposals to guide a comprehensive peace settlement between them under Egyptian mediation. Buoyed by strong support from member-nations, including four out of five Security Council members, UN Secretary-General Kofi Annan has firmly rejected the demand of some American lawmakers to resign in view of allegations of corruption in the oil-for-food programme. Disgruntled American troops waiting in the Kuwaiti desert to go into Iraq today challenged US Defence Secretary Donald Rumfeld about their safety and how long they would be in the country. Members of a US special operations task force punched and abused prisoners in Iraq in front of Defence Intelligence Agency (DIA) agents and then threatened the agents to try to keep them quiet, a document stated. 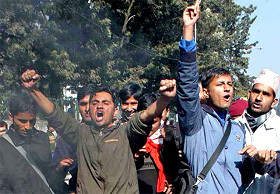 Pro-democracy student protesters raise anti-King slogans during a demonstration in Kathmandu, Nepal, on Wednesday. Dozens of establishment figures, including five former ambassadors and leading military officers, signed an open letter to Prime Minister Tony Blair today calling for an inquiry into the deaths of Iraqis after the war. The Pakistan Government pushed a Bill against honour killings through the Senate on Tuesday amid an Opposition walkout, but promised to consider Opposition amendments to improve the law in the future. Chicago rapper Kanye West, who survived a near-fatal car crash to record a debut album that ranked among the year's biggest sellers, led the field of Grammy Award contenders with 10 nominations, organisers said on Tuesday. R&B singers Alicia Keys and Usher picked up eight nominations each, followed by late "Genius of Soul" Ray Charles with seven and punk rock band Green Day with six. Pakistan Islamist women demand Musharraf to quit as army chief. Egyptian official news agency, MENA, quoted high-level sources to have said that the move had the backing of both the USA and the European Union and the steps included a ceasefire, a key Israeli demand. "High-level sources confirmed an important understanding, reaching the point of an agreement in principle, has been completed between Egypt, Israel, the Palestinians and several active international parties, America and Europe, regarding a comprehensive settlement to the Israeli-Palestinian struggle," the agency said. The Palestinian side is said to have committed to check operations against Israeli targets and Jerusalem in turn would put a halt to all military actions as long as the Palestinian commitment held. As per the report, Prime Minister Ariel Sharon does not find it necessary to sign a ceasefire agreement until the security and administrative capabilities of the Palestinian Authority are rebuilt gradually. The understanding could lead to a "comprehensive solution to the Israeli-Palestinian conflict," MENA said. Israeli officials have termed the report "a little premature," but said it would respond positively if militants ceased attacks. Mr Annan’s second term ends on December 31, 2006, and indications from officials and diplomats were that he would complete his tenure despite pressure from the lawmakers. Mr Annan’s reply came up in the wake of five Republican Congressmen on Monday joining another of their colleagues to call for his resignation. Mr Rumsfeld flew to Camp Buehring 20 km from the Iraq border, to face one of the toughest question and answer sessions with troops since the start of the Iraq war in March 2003. A letter from the head of the DIA to a senior Pentagon intelligence official, which detailed previously unknown incidents of abuse by the US forces on prisoners in Iraq, said the agents also saw detainees with burn marks and bruises. It was written two months after photographs of the US soldiers abusing prisoners at Abu Ghraib jail near Baghdad became public, and five months after American commanders in Iraq first learned of the Abu Ghraib abuse. The Abu Ghraib revelations prompted international outrage and undercut US credibility as it sought to stabilise Iraq amid a bloody insurgency after last year’s invasion. The new revelations of abuses elsewhere were included in a June 25 letter from Navy Vice-Admiral Lowell Jacoby, director of the DIA, to Stephen Cambone, undersecretary of defence for intelligence. Mr Bianca Jagger, a human rights campaigner, and leading clerics also lent their support to the campaign, which will raise concern over claims that as many as 98,000 Iraqis may have died in the aftermath of the war. They wrote, "Your government is obliged under international humanitarian law to protect the civilian population during military operations in Iraq...Without counting the dead and injured, no one can know whether Britain and its coalition partners are meeting these obligations. We urge you immediately to commission a comprehensive, independent inquiry to determine with the greatest possible accuracy how many Iraqis have died or been injured since March 2003, and the cause of the casualties." Signatories included Ms Elizabeth Wilmshurst, former Foreign Office lawyer who resigned over the legality of the war, writer Harold Pinter, the Rt Rev Richard Harries, the Bishop of Oxford, Rt Rev Colin Bennetts, the Bishop of Coventry, academics and five former ambassadors, including Sir Stephen Egerton, former ambassador to Iraq. Former Assistant Chief of Defence Staff Lord Garden put his name to the appeal, alongside retired Gen Sir Hugh Beach. Labour MPs opposed to the war gave their backing to the campaign last night. The lawyer and Labour peer, Baroness Kennedy QC, also signed the open letter. The government has rejected the estimate in The Lancet, the respected medical journal, and said it was based on imprecise data. Mr John Sloboda, co-founder of Iraq Body Count, said, "Having made no effort to count Iraqi casualties, the British Government says reliable figures are not available. No figures in a war zone are going to be perfect, but that's no excuse for not trying." The Lancet said the research was based on a sample of fewer than 1,000 Iraqi households, but said the findings were convincing. The study by US and Iraqi researchers was led by Johns Hopkins Bloomberg school of public health in Baltimore. In November, Foreign Secretary Jack Straw said the government supported an estimate from Iraq's Ministry of Health that 3,853 civilians were killed and 15,517 injured between April and October this year, which may include insurgents. The Criminal Law (Amendment) Bill, amending the Pakistan Penal Code and the Criminal Procedure Code and prescribing up to the death penalty for honour killings, was passed by the National Assembly in October. Now, it only needs a formal presidential assent to become a law. Several members from the Opposition and Treasury Benches pointed to certain flaws and deficiencies in the Bill and wanted the draft to be re-examined by the Upper House committee on law and justice. But the government went ahead with the adoption of the Bill as passed by the Assembly after Democratic Alliance leader Raza Rabbani said his group planned to move a private Bill on the issue. But before the Bill was put to voice vote for passage, Mr Rabbani led the walkout by all members of the alliance along with the Muttahida Majlis-i-Amal to protest against what he called an incomplete Bill and the government's refusal to accommodate the Opposition's amendments. Five amendments moved by MMA senators were rejected while Mr Rabbani said earlier he was not moving but placing on the table of the House amendments proposed by the Pakistan People's Party parliamentarians. Chicago rapper Kanye West, who survived a near-fatal car crash to record a debut album that ranked among the year's biggest sellers, led the field of Grammy Award contenders with 10 nominations, organisers said on Tuesday. R&B singers Alicia Keys and Usher picked up eight nominations each, followed by late "Genius of Soul" Ray Charles with seven and punk rock band Green Day with six. Jazz pianist Norah Jones, country veteran Loretta Lynn, funk musician Prince and engineer Al Schmitt each earned five. "If I get any nominations, I'm good," West said after a press conference where the nominations were announced. "But 10 is like overwhelming. I won't even lie. It's really just as much scary as it makes you happy." His debut album, "The College Dropout," a soulful mix of hip-hop and gangster rap, has sold over 2.5 million copies in the USA, making it the year's fifth-biggest seller. south-west China's Sichuan province, the state media reported on Wednesday.